Ahead of Iowa Caucus, Kasich Holds 85th Town Hall in N.H.
An Elks lodge in Salem was the scene of John Kasich's 85th town hall in New Hampshire. Sunday afternoon, with other candidates campaigning in Iowa ahead of that state's first-in-the-nation caucus, Kasich continued along the campaign trail in the Granite State. "I'm going to look at a problem and I'm going to go fix it," he said. Kasich spoke with the crowd for a little more than an hour, answering questions about policy and what he would do as president. But why is he the only candidate in New Hampshire this weekend while all others are in Iowa ahead of the caucuses? "Well, I've been to Iowa. I was there for the debate, the day after, the day before," he said. "I've been there a number of times, but there is only one of me." The governor also talked about the geography of Iowa making it less cost-effective, because you have to fly from city to city, whereas in New Hampshire, he can take his bus. "There's 1.3 million people, You can meet - you know, I've met all of them twice, I only have three more times to go," Kasich said. "It's just a perfect place." But there could be other motives for staying out of the Hawkeye State. "Kasich isn't doing well in Iowa," said Erin O'Brien, the chair of the political science department at UMass Boston. O'Brien explains Kasich's strategy may have more to do with what he's doing well in New Hampshire as opposed to what may not be going well in Iowa. 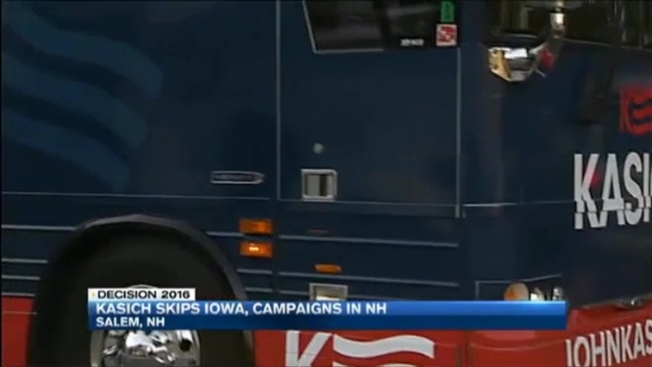 "His advertising in New Hampshire is widely considered the best of the campaign," she said. "He has some inroads." Kasich is likely using those things, and his town hall, face-to-face meetings with voters to his advantage in New Hampshire. "This is a testing time for candidates, and you can't hide behind a 30-second commercial when you are in New Hampshire," he said. The governor left to head to another town hall meeting in Bow Hampshire for his 86th town hall.